On their first collaborative release, A Dimension Reflected, Jourdan Laik and Phillip Wilkerson present eight thought-bending, deep drifting tracks of pure ambient spaces, where electronic yet organic, expansive washes of sound, drifting chords and swirling synthesizer textures communicate the resonant beauty of time and timelessness. This concept of the time-suspending power of music is a discipline also explored by artists like Steve Roach, Robert Rich, Brian Eno, Robert Fripp, and Klaus Schulze. The music of Laik and Wilkerson taps into that same eternal flow. Combining electronic instruments with deep, rich effects processing, Laik and Wilkerson create subtle but purposeful compositions of soundscapes – or timescapes – that guide the listener’s attention to full awareness of the eternal present moment, while simultaneously suspending the subjective passage of time. Beatless—timeless—floating and quiet, A Dimension Reflected is music for mindfulness, for being present; it is Presence Music. Time, there is something special about time. Personally I seldom find myself in the position of having too much time and most often my time flies away on a flurry of subtle wings never to be seen again. Time Being is a project dedicated to the flow of time by the ambient artists Jourdan Laik and Phillip Wilkerson. The music is described as being beat-less timeless, flowing and quiet and already on the first track Everending the serenity of A Dimension Reflected soothes my skittering mind with its solemn sanctuary. This is music for a waking dream, a soundtrack to distant places where everyone journey from time to time in search for relief from the day to day drudgery. The music, or rather the ambience, is like a soothing mist that descends slowly and sweeps across the void in my den with its warm and comforting sounds. It invites to a slow and gentle descent into swirling atmospheres and sweeping scores of meditative sounds that evolves throughout the album into a beautiful yet mutating nature. A Dimension Reflected is one of those albums that instantly strike a weak spot somewhere inside my shredded mind. It sweeps me up like a leaf in the wind and even my quite harsh work feels a bit easier when the atmospheres of beyond flows through my headphones. Having played this album for quite a while now I have found little to no weakness in its craftsmanship. All tracks are brilliant in their own way and Future Forming is an extremely good example of flowing ambient music when it is at its best. It starts up dark and brooding yet serene and delicate at the same time only to evolve into a drifting space of harmonious tones and swells. If I ever start an obscure pub or a bar in my woodland home this is the kind of music I would put on repeat in the background. Time Being is really a project that I will follow from this day forth. This album clears a path to the magical and timeless landscape that my mind can concoct and as my mind drifts towards the borderland of dreams the sweeping drones and harmonic strings is the guide that leads me deeper in. Tracks flow by and in the end time manifests itself in the form of the albums end. I would highly recommend A Dimension Reflected to individuals in search of deep atmospheric ambience. Jourdan Laik and Phillip Wilkerson have with Time Being formed a contemplative project that reminds me of what it is to be alive and dreaming. We live in fast times and most of us work too much and too hard without ever wondering why. A Dimension Reflected is a balm for a frenzied soul and I hope to hear more from Time being, in time..
Time Being is a co-work project of US based Phillip Wilkerson, who is known for his extended discography, mostly featuring download only releases on various netlabels, and his country-mate Jourdan Laik, who has released few albums as Paradisaic and Daevine (this one as collaborative project with Michael Allison of Darshan Ambient). I think Jourdan is rather known for his work as a crafted photographer and graphic designer, but now it's time to change this. Time Being, centered around tranquil and peaceful ambient voyages, begins with "Everending", a nicely floating piece that sets the atmosphere for the whole album. Desert ambience at its best!!! Immense and dreamy "Dust Of Sorts" is another pure beauty! Deeper and darker droning parts on "Future Forming" are here and there smoothly balanced with some lighter sounds, definitely one of my fave pieces on this album! "In The Care Of Knowing" is just the opposite with its lively texture, enriched by location recordings (cicadas for example), warm and relaxing. Follows "Present Bending" with few dramatic elements and slowly circulating tension. The next one, "Static Flow", exactly corresponds with its title, deeply evocative and immersive, later colored with bells, noises and otherwordly sounds. Another big one and ear-catching addition to the overall concept of the album. "As You Pass This Way" quickly finds its way to dreamy ethereal mood, all tension is relieved. A very relaxing listening that overlaps also into the closing title composition, "Time Being", this is a stunning celestial journey! "A Dimension Reflected" is a very potential and promising collaboration between experienced sculptor and young talent. Keep on going, Phillip and Jourdan!!! I can't recommend enough this CD to all those who are devoted to heavenly ambient realms!!! 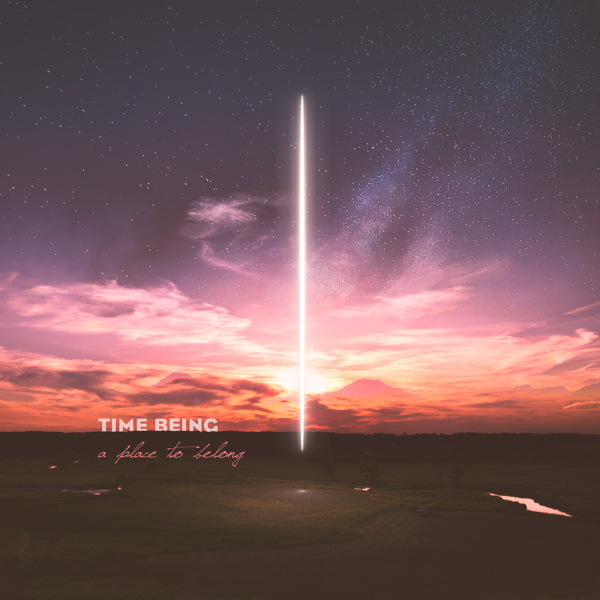 Ambient composers Jourdan Laik and Philip Wilkerson have joined forces using the musical moniker Time Being. With "A Dimension Reflected" they deliver their first tour-de-force release of ethereal and expansive drift music, an attempt to capture the essence and beauty of the present moment in time. The album is filled with eight flowing and interconnected tracks of elevating and beatless textural soundscapes. All are drenched in tranquillity and heart-felt emotion, smoothly curling and shapeshifting as they drift along and fade away in various colours and multi-dimensional forms. This concept album, in appreciation of the expression of the human perception of time, opens up gateways into profound ambient spaces and seas of bliss, which spacemusic fans will love. Recommended. The first release from the duo of Phillip Wilkerson and Jourdan Laik, "A Dimension Reflected" is a stately and wistful collection of pure ambient music. That is to say, these 8 extended passages are fleeting and vaporous clouds of relaxing and peacefully mysterious electronic drones and pulses. Think Steve Roach, Robert Rich, or classic Brian Eno. "Dust Of Sorts" shimmers and sparkles, reminding of a lovely lake at dawn, rife with ripples and reflections. "Future Forming" is majestic, with a hint of shadow. Beautiful music here, and perfect for unwinding to. A Dimension Reflected consists of a series of smooth, drifting electronic expanses wherein synthetic drones, flushes and currents of tone and noise gradually heave and lazily whirl. 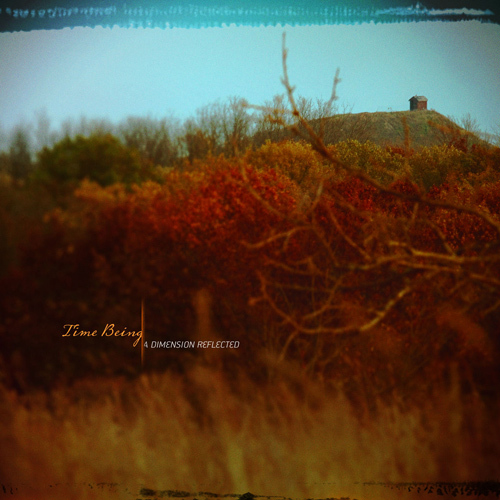 Time Being combine “electronic instruments with deep, rich effects” to create soft-focus mindscapes where time seems to imperceptibly alter in nature: to slow, to pause, to rest? The individual compositions morph and spread like clouds around a single tonal focus; minimal in melodic structure, beatless, meandering, timeless. Liquid blips, sparkling textures, pulsing susurrations and reverberating infusions periodically detail the slowly shifting zones and evolving chordal forms. In general, the various pieces are harmoniously inviting and eminently serene, the dark undertones that well up from below lit from above with warm washes, animated by organic infusions. ARTWORK A Dimension Reflected arrives in a neat jewelcase with a two panel insert. There is a dreamy feel to the hazy, grainy, colour-saturated imagery that runs throughout the package. Photographs of quiet places, smooth skies and dense nature. The front cover holds a scene of inclement season: the bare trees and heavy hues suggestive of winter’s onset or early spring. Overlaid borders create an impression of photo-chemicals creeping onto the imagery. The rear cover is mostly sky: a graduated aqua-blue to ocean-green (almost as if seen from underwater) with tree tops on the bottom edge mirrored in the chemical blotches along the topmost border. Track titles are here with minimal credits. Within the two-panel spread is given over to an evocative shot of close-up grass heads, soft focus background undulations and blue-green submerged sky. The only text here is a short poetic stanza on the subject matter of the album. OVERALL Time Being is the project title taken on by collaborating ambient musicians Phillip Wilkerson and Jourdan Laik. Their first release in partnership, A Dimension Reflected explores a shared interest in the nature and perception of time. The album is delivered via the Lotuspike label, a subsidiary of Spotted Peccary and contains eight mid-length tracks ranging from three minutes forty one to eleven twenty nine. 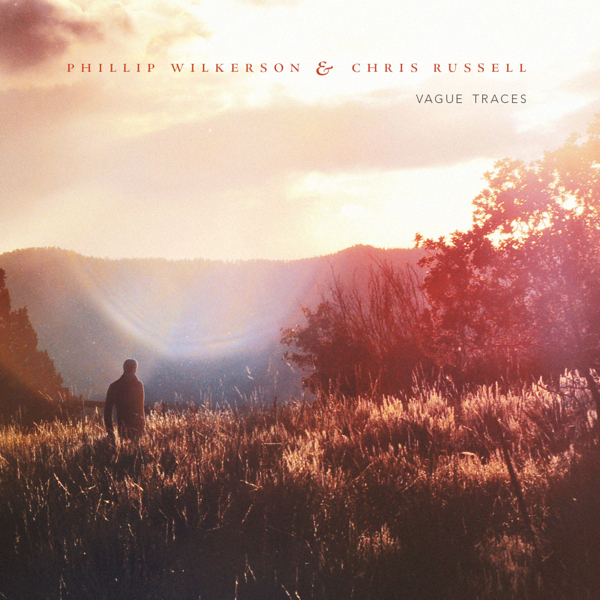 Promotional material offers: “Laik and Wilkerson create subtle but purposeful compositions of soundscapes – or timescapes – that guide the listener’s attention to full awareness of the eternal present moment, whilst simultaneously suspending the subjective passage of time.” Experience it for yourself; these attractive recordings certainly absorb the attention in dislocated reverie if allowed to do so. Although it will make me sound like a complete shill to say so, I’m of the opinion that any project involving Phillip Wilkerson is a project extremely worth listening to. His solo works, including his long-form-drone offerings as Jane’s Scenic Drive, show a diversity of approach and a willingness to re-create himself each time out. Now, paired with Jourdan Laik as the duo Time Being, Wilkerson presents another side of his growing output–a soft, reflective disc that holds time in its hands to let the listener look deep within it. A Dimension Reflected takes gentle hold immediately as Laik and Wilkerson spin a velvety cocoon of classic ambient drifts. Most of the work here is on the uplifting side; warm, light tones that float above the listener and invite you to follow, excellent exercises in slowing the breath and seeming to soften the air around you. The duo do spend a short amount of time, most notably in “Future Forming,” skirting the edges of shadow and colder spaces without dropping into total darkness. Low-end, grumbling drones are tinted with high notes that fall like sunlight in their midst. With that out of the way, the meditative movements continue, the overall flow absolutely demanding it be played on loop. This is a work that will round off the harsh edges of your day, set your mind at ease and let you peacefully wander off to some quiet space inside yourself. I do hope to hear much more from Time Being–A Dimension Reflected is a superb debut. Being present all the time and to value the timelessness of every second is the maxim that granted itself the new duet of ambient EM; Time Being. Photographers and musicians inspired by works of Brian Eno, Steve Roach, Robert Rich and the other pioneers of ambient EM, Jourdan Laik and Phillip Wilkerson are very appealed by the static and floating tones of the Landscapes style, promulgated by American artists in the 80’s, the cradle of New Age. Completely ambient, without percussions nor sequences, A Dimension Reflected is constituted of 8 tracks which become entangled in a same musical dimension. A dimension which respects the nuanced colors of the artwork which seems to be the link of a musical pact for those who like to transposed colors into ambiance. "Everending" hatches with fine ethereal lines where astral choirs criss-cross green fanciful meadows full of subtle birds chirping. Delicate, "Everending" evolves in ambient and atmospheric mode with a skilful mixture of timid drones and smooth angelic synth layers which float as the big winged impulsions of American eagles. More serene, "Dust of Sorts" fits to "Everending" same lines but with a more melodious approach where celestial voices penetrate even deeper the gleaming synth lines. "Future Forming" presents the dark side of Time Being with long reverberant drones which float heavily among twinkling scattered arpeggios and more limpid synth gentle winds. It’s a very good track which plays on nuances of darkness and luminosity, quite as powerful "Present Bending" which is, on the other hand, more introspective and quite nearer Steve Roach ambient structures, "Future Forming" melts in contrast with the twinkling "In The Care Of Knowing" which demonstrates a clear influence for Michael Streans’ complex harmonies. The more we move in A Dimension Reflected, the more we fall under the spell of music without borders of which the only beatings are the implosions of its movements. Morphic movements to hybrid layers which juggle through latent reverberations and astral winds swollen by abstract choruses as in "Present Bending" and the intense "Static Flow" which seizes by the duality of its harmonies buried in a long linear movement. After 2 intense tracks, "As You Pass This Way" emerges as morning dew with its glittering harmonious structure which sparkles of a thousand melodious prisms. A track which, isolated, can seem banal and quite very New Age with its David Lanz approach, but inserted between "Present Bending" and "Static Flow" displays all its musicality with a structure in suspension where float nice lines bursting of limpidity and scattered chords which concoct a very nice cocktail of subdivided harmonies on a long movement always on horseback between the gloom of afternoon rains and the sun which dry its traces. "Time Being" concludes this gamut of musical assortments all the same rather paradoxical with a track as harmonious as "As You Pass This Way" but with a more electronic approach where synth layers float, as celestial as in "Everending", and whose long musical flights remain suspended in moment, giving the necessary time to sinuous melodies buried in the astral depths to join for a tasty one-dimensional whirlwind where harmonies and stillness get united in a last temporal flight. I quite enjoyed my first experience with Jourdan Laik and Phillip Wilkerson tandem. With A Dimension Reflected the duet of photographers / musicians displays an American musical analogy which joins so much the fragrances of a discreet New Age, with influences so diversified as David Lanz and other artists of the Narada label, to a stronger EM in the field of Steve Roach, Robert Rich and Michael Stearns. A Dimension Reflected pleasantly surprised me. It is a nice bedside album, filled with surprising morphic layers to hybrid musical tints. A beautiful find which enlarges Spotted Peccary Music's catalogue. Ben Cox's label shows one more time its commitment to pick up and promote an EM which presents its musicality between the spheres of a complex EM and another more crystal clear and harmonious in a mainly ambient sphere. There is nothing bad in it, as long as it remains beautiful as A Dimension Reflected from Time Being.